During the course of putting this website together I came across a few typographical blunders which may amuse you. I only have space for a few though there are many more. The classic ones come from the band's own promotional World Record tour brochure. Out of a band of four people they manage to mis-spell two names. I give you Mr. Panton and Mr. Evens! But worse than that the brochure producers (who shall remain nameless) even manage to get the name of the band wrong! So here's Van der Graat! 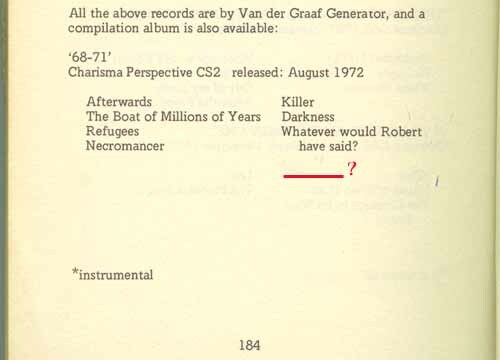 Even Killers, Angels, Refugees, the PH/VdGG fan's bible of the 70's, doesn't escape. The track "Lost" from the 68-71 album does indeed seem to be truly lost! (I wonder if that was deliberate?). 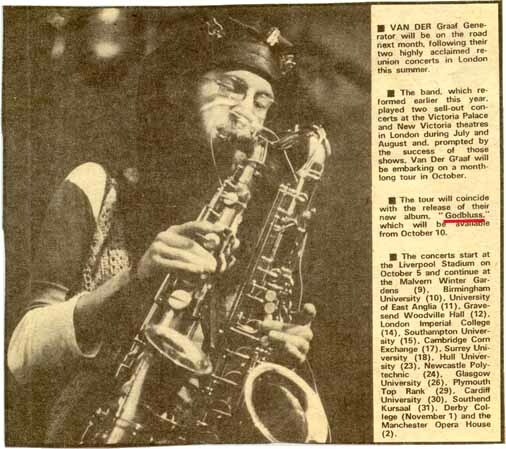 The last one though belongs to the Melody Maker and I include it really as an excuse to show another picture of the great Dave Jackson, the "Van Gogh of the Saxophone". Anyway, I thought it was Godbluff.